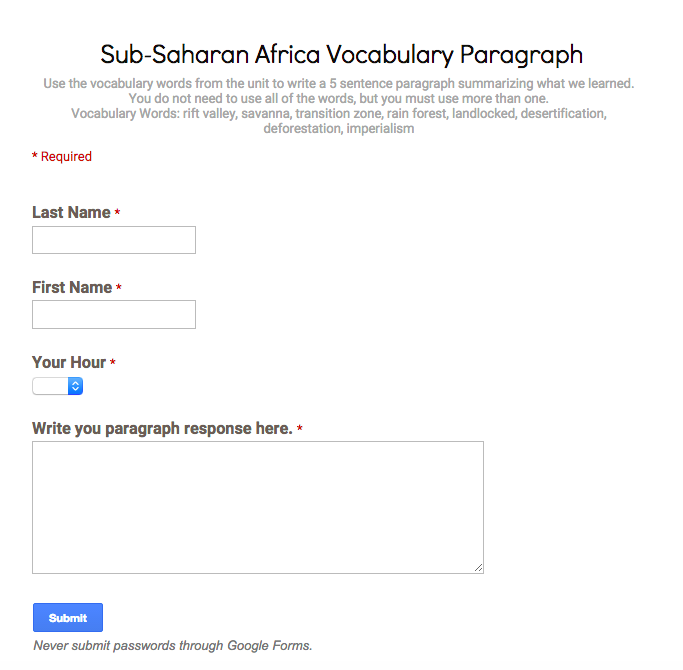 First, I want to introduce you to one of the ways that I use Google Forms in my classroom. I recently had the opportunity to attend a conference featuring Anita Archer and her presentation on explicit instruction. One of the items she discussed was vocabulary and the importance of revisiting key vocabulary words throughout the school year. It isn’t enough to introduce the words at the beginning of a unit and test them at the end of the unit. If they are truly words that are essential to our content then we should be teaching and reteaching them well after they have been tested on the words, and in a variety of different ways. This led me to vocabulary paragraphs where I require the students to use vocabulary words to describe the region of the world that we are learning about. They are not using the definitions of the words, but are rather proving that they know how to use the words in a sentence and that they are able to make connections between the different words to form a well composed paragraph. I created my form and shared the link on my school website to make it as quick and easily accessible as possible. This is an example of one vocabulary paragraph form that I have assigned to students. Directions are at the top on the screen, then students type their first and last names, select their hour from the drop down menu, and type their paragraph in the box. Essentially an online activity that’s easy to use and easy to assess! The best part about Google Forms is the way responses are recorded for teachers to use. After a student clicks the blue Submit button at the bottom of the screen, they receive a confirmation screen letting them know that their response has been recorded. On the teacher end of the Google Universe, a Google spreadsheet is automatically produced that includes responses from every student. Google Sheets is essentially Google’s version of Microsoft Excel and can be accessed here. This is an example of a Google Sheet containing responses from students on one of my vocabulary paragraph assignments. 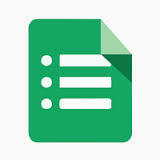 Teachers in my building have also used Google Forms for book reports, group project sign ups, quizzes (more information to follow on this, including a built in grading tool! ), and exit tickets. Be sure to check out this list of 81 ways to use Forms in your classroom. How could you use Google Forms in your classroom? Comment below, I’m always looking for new ideas for my classroom and I would love to borrow (let’s be honest, steal) your ideas!